State-owned Ukrainian Institute for Designing Iron and Steel Works was founded by Order No. 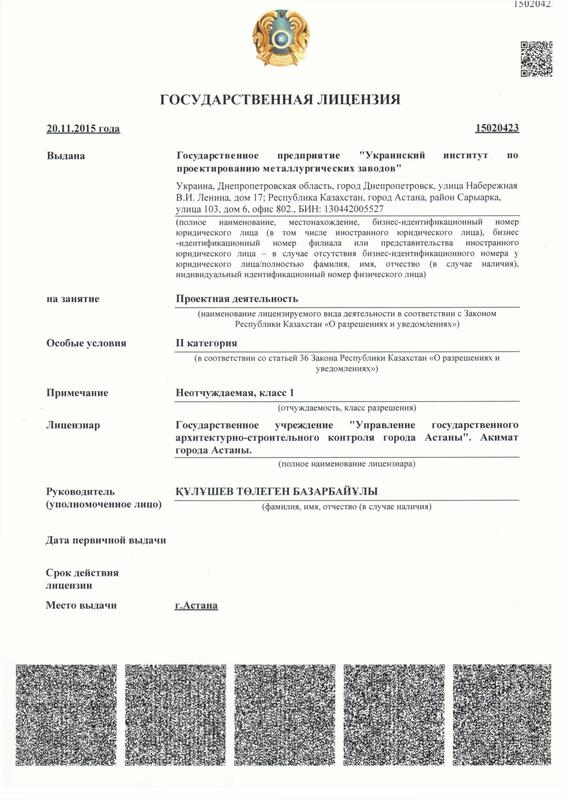 134 issued by Peoples’ Commissariat of Steel Industry of USSR on March 13, 1944, as Dnepropetrovsk subsidiary of Gipromez Institute (Moscow) with the purpose to develop designing documents for restoration of iron and steel plants in the Dneper-side region wrecked during the Great Patriotic War. According to Resolution No. 815 issued on June 24, 1958 by Council of Ministers of the Ukrainian SSR, the subsidiary was transformed into Ukrainian State Institute for Designing Iron and Steel Works. In December, 2005, the Institution was given the new name of State-owned Ukrainian Institute for Designing Iron and Steel Works (GP UKRGIPROMEZ). Innovation policy for metallurgical complex of the country is to great extent created by GP UKRGIPROMEZ, which was enlisted by Resolution No. 1734 issued on December 23, 2004 by Cabinet of Ministers of Ukraine as one of the institutions of strategic significance for state economy and safety. GP UKRGIPROMEZ was assigned the leading institute in comprehensive designing of iron and steel works by Order No. 254 issued by Ministry of Industrial Policy of Ukraine on July 12, 1999. GP UKRGIPROMEZ has been attributed to Group A and recognized as the leading institution for scientific and technological support of comprehensive designing of iron and steel works. 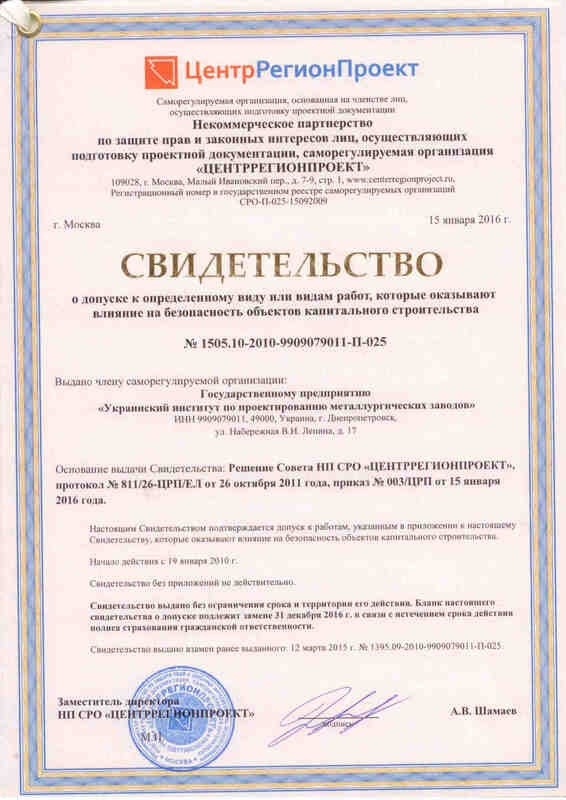 Certificate No.01457 was issued by Science, Innovations and Information Technology Agency of Ukraine on May 18, 2011, to warrant that GP UKRGIPROMEZ was included into State Register of the state-backed scientific institutions. GP UKRGIPROMEZ is the Principal Designer for major iron and steel works and all pipe plants in Ukraine. From its establishment till date, the Institute takes active part in development design and engineering documentation for construction, modernization and retrofitting of iron and steel works in Ukraine, Russia, Moldova, Byelorus, Georgia, India, Korea, Vietnam, China, Egypt, Hungary, Poland, Cerbia, Montenegro, Bulgaria, Czechia and Slovakia, Algeria, Nigeria, India and Pakistan. For more than half a century, GP UKRGIPROMEZ experts are engaged in design and engineering of up-to-date sinter plants, blast furnace and steelmaking shops, rolling mills and pipe plants as well as utilities, transport and repair facilities, auxiliary units, supporting facilities, social and amenity projects. Ukrainian Institute for Designing Iron and Steel Works has overcome obstacles, introducing advanced scientific and technical ideas, improving the competitiveness of designs and perfecting engineering concepts. Front-office policy of GP UKRGIPROMEZ is based on modern principles of operational management, high quality of designing estimates, use of up-to-date computer technologies and certified software for design development, incorporation of power-saving and environment-friendly processes into designs, ensuring safe labor conditions and working environment for employees. GP UKRGIPROMEZ interacts with more than 20 scientific, research and educational institutions in the field of iron and steel industry as well as with many foreign companies. Nowadays, the manpower of GP UKRGIPROMEZ is over 800, including around 750 highly qualified design engineers of 50 disciplines, who have many-years’ experience in designing of steel plants employing the latest domestic and foreign expertise in introduction of advanced technologies, state-of-the-art equipment and environmental protection measures. Institute activities have got nationwide and international recognition. Major developments are up to the world standards, they are covered with patents and inventor’s certificates. 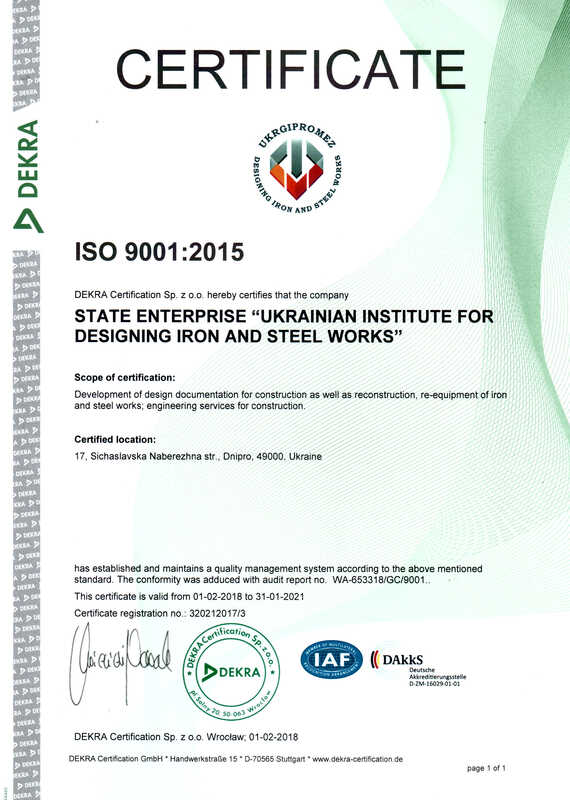 Certification audit is periodically held by DEKRA Certification Company confirming that Quality Management System of the Institute meets the requirements of International standard ISO 9001:2008 and is efficient. GP UKRGIPROMEZ designs have been awarded with 10 State Prizes of the USSR and Ukraine, as well as with 16 Prizes of Council of Ministers of the USSR; 800 inventor’s certificates and over 250 patents for intellectual property inventions have been received; 22 licences have been sold; tens of monographs, manuals and reference books on iron and steel making aspects have been published. Comprehensive approach to designing, including profound knowledge of experts, continuous improvement of personnel qualification, compliance of service quality with international standards and maximum customization contribute to success.